This is the Visoflex II, OTXBO magnifier, 65/3.5 Elmar with Bellows II on an M3. To see Roy Moss' article on the 65mm Elmar, please visit the LHSA 'Viewfinder' article by clicking on the photo. My very large thanks to Roy Moss for permission to use this image. Here begins the odyssey of finding out about the Universal Focusing Bellows. Pretty much since the beginning of the Leica rangefinder, Leica have provided some sort of device for copying or using the camera for macro work. This also includes what could be thought of as the origins of the Over-Head Projector: The X-Ray Reproduction Apparatus from 1936. Check it out in one of the old Hove reproductions of the Leica General Catalogue, it's something to behold. "It allows not only of reproducing at a reduced scale objects of size up to 26 X 17 ins., filling the entire area of the negative, but also of taking objects as small as 2.4 X 3.6mm., i.e. at a magnification up to X 10, on the Leica negative." A basic setup [GROOW] would cost 18 U.K. pounds. A more than basic setup [REOOD] would cost you 45 U.K. pounds. <sigh>. Of course, with the addition of a microscope to the setup, you could increase this magnification to whatever your microscope was able to deliver. I should note here that if you are at all interested in the scientific applications of the Leica, you should start with Heinrich Stockler's book 'The Leica in Professional Practice', Fountain Press: London, 1954. However, you should be warned, some of the photographic content is very disturbing. The earliest version of the modern incarnation of the Universal Focusing Bellows I have found is listed from 1951, the UXOOR, which came with an adapter for the 135 Hektor. With the addition of a UYCOO bayonet adapter you could also use the bellows with a 50 Elmar. The following adapters were also available between1951 and 1960. Source: 'The Leica Collectors Guide 1925 -1960', cmpiled by D.R. Grossmark, Hove Camera Foto Books: 1976. There were also a number of lens shades and masks made available for the UXOOR between 1951 and 1960, i'll leave listing those for now, if you are truly in need of this information, please let me know. Combining this information with a 1973 Leica catalogue, i'm hoping to merge the information based on the graphical depiction with the numerical codes. Note: Bayonet lenses provide greater magnification. Worthy of note is the difference in the adapters 16558 and 16556 with regard to their ratios. There is no difference insofar as their operation for the Tele-Elmar, Elmar and Elmarit 90, with the exception of the Elmar 65. Another thing to note, 35, 50, 65 and 125 Hektor lenses are fitted directly to their various adapters and on to the bellows. As will be familiar to most Visoflex users, only the lens heads from the other lenses are used in conjunction with adapters. 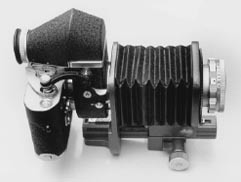 The Model II bellows for Visoflexes II, IIa and III extend 9.5 cm. and are mounted on a guide rail using a rack and pinion movement The side of the rail includes a guide to magnification (1 to 0) that is for the 90mm lens (excluding the Summicron 90) and a measuremnent for exposure factors. The other side of the rail, in green, is a millimetre scale that runs from 0 to 95. One of the apparently cool things about the bellows II is that you can use it with screwmount versions of the Viso II. So yes, old Leicas really do never die, but I needn't have told you that, right? The fixed scale of reproduction is for the 90mm lenses excluding the Summicron. Using the Elmar or Elmarit provides the opportunity to use the scales provided on the side of the bellows. Extending the front of the bellows so that the white arrow on the back of the bellows indicates the scale of reproduction on the left side (In Red) gives you all the indication you need to make a shot with these lenses. For other lenses, use the green scale. Make the image recognisable on the ground glass and then move the whole assembly forward and backward by turning the right-hand knob. When the image is absolutely sharp, push the locking lever forward. Alternatively, use the left-hand knob for roughly adjusting the image and the right-hand knob for final focus. To move from horizontal to vertical shots, you can press the catch at the rear of the bellows and move the assembly 90 degrees. To dismantle the assembly, you should make sure the camera is in the horizontal position, otherwise you may "foul" the front focusing movement of the bellows. In the next couple of weeks I hope to have a scan here of the tables that will guide you through the scales of reproduction for the individual lenses on the bellows II. However, I hope this is enough to get most people started using the Leica and bellows. I should also note that depending on the author of the information about the use of the bellows II, there does seem to be a number of discrepancies with regard to the available ratios possible with individual lenses. Unless otherwise noted, the ratios I have specified above are from the January 1973 'Leica General Catalogue of Photographic Equipment and Special Programme'. As always, i'm glad to hear from people who know more about this than I do. And i'm not ashamed to admit--there's many. Andrew Matheson, 'The Leica and Leicaflex Way: The Leica and Leicaflex Photographer's Companion' [Focal Press: London and New York], 1972. Heinrich Stockler, 'The Leica in Professional Practice' [Fountain Press: London], 1954. Morgan and Morgan, 'Leica Manual: The Complete Book of 35mm Photography' [Morgan & Morgan: New York], 1973.